Dorm Co. Tip: All dorms can use a little light! Freshen up your college dorm decor with some Color Cotton - String Lights! It's perfect for draping around your Twin XL bed, your college closet or dorm desk, or framing a photo wall of all your favorite people in your dorm room. With six feet of flexible wire, your string lights are as flexible and versatile as your creativity! Bright LED lights make for perfect mood lighting for a relaxed and chill dorm environment, without having your harsh overhead dorm room light on at all times of the day and night. The best part of our LED String Lights is that they’re battery operated so you never have to worry about taking up an outlet on your college dorm surge protector just to plug in your favorite dorm string lights. 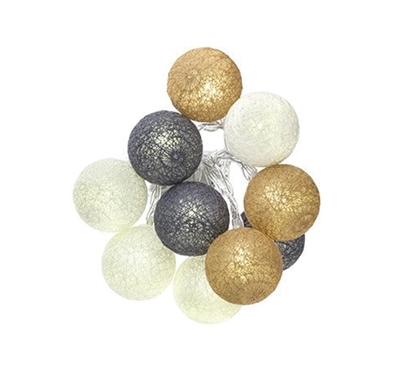 The perfect white, gray, and gold color of our string lights make our dorm string light accessory perfect for blending in with any dorm decor style or being the focal point of your college decoration for your dorm room. Brighten up your college dorm decor with some festive and modern string lights.